Also available for download: Microsoft Word format (click here - 273 Kb) or Acrobat pdf file (click here 316 Kb). A short season of fieldwork in late March on the island of Marawah, north-west of Mirfa, has produced remarkable results - even if they weren't quite what was expected! The fieldwork concentrated on the group of mounds at Site MR 11, on the north-western tip of the central limestone plateau, overlooking an infilled embayment. The excavation was directed by Dr. Joe Elders, a long-time ADIAS team member, who is currently the chief archaeologist for the Church of England, assisted by John Martin, another long-term team member, and, for part of the time, by our ADIAS assistant Ingrid Barcelo. Originally noted in the 1st ADIAS season in 1992, the group of mounds were first subjected to excavation in 2000, when the surface of one of them was partly cleared by Joe Elders and John. 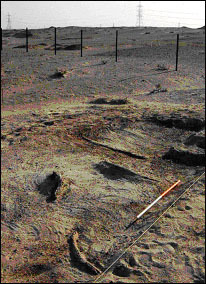 This 2000 work revealed a pattern of walls that coincided precisely in dimensions with the pre-Islamic church on Sir Bani Yas, and the site was, therefore, interpreted as another church, although, cautiously, Joe noted that there was no sign of the building ever having been finished and plastered, in the Sir Bani Yas style. That caution proved this year to have been absolutely appropriate. In further excavations of the building, involving the clearing away of more collapsed rubble, it became apparent that there were several more walls that bore no relation whatsoever to the projected plan of a church. In all, the walls of a total of five rooms have now been identified, although none of them have yet been cleared down to the natural rock surface. The only find, from fairly high up in the rubble layer, was a flint arrowhead, of typical Neolithic (Late Stone Age) type. A few metres away, John Martin and Dr. Mark Beech, our Senior Resident Archaeologist, identified what appeared to be the remains of another wall on the top of a low mound. Excavation, undertaken mainly by John, proved that a rectangular stone structure lay under the surface of the mound, measuring 2.4 metres east-west and 1.2 metres north-south, with a doorway in the north wall adjacent to the north-east corner. 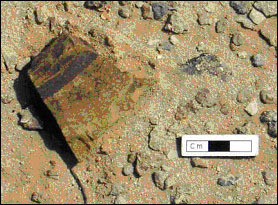 Following the removal of blown sand and collapsed rubble, a Neolithic flint spearhead was found in the lowest lens of rubble and sand, just above the surface of a dark occupation layer, which appeared to spread from outside the walls under them and then into the room itself. Samples of this layer were taken from outside the building and proved to contain charcoal fragments and tiny fragments of bone. Some of the charcoal has now been sent to Britain for C14 dating. A small rubbed stone, with possible evidence of having been used as a 'pounder' or pestle, was lying on the dark layer inside the building. A brief investigation a little downslope of the second building also proved the presence of another wall, surviving to at least three courses. The finds from this year's season mean that it is no longer possible for the interpretation of the first building as a church to be supported. The finding of Neolithic artefacts in both buildings may suggest that MR 11 is a settlement of this date, roughly equivalent to MR 1, around two km, to the west. There are several other mounds yet to be investigated - larger, in fact, than those which have already been tested - and these may possibly conceal further buildings. Only C14 dating of the charcoal can provide a definitive indication of the date of the site at the moment and the results of the dating are eagerly awaited! If, (and this is, of course, only a possibility at this stage), the MR 11 site is proven to be a Neolithic settlement site, it will be of enormous importance at a regional level, since no other Neolithic buildings of such a size and state of preservation have yet been identified anywhere else in eastern Arabia. Not surprisingly, more excavation work is being planned for next winter! As regular readers of the Occasional Newsletter will know, ADIAS collaborates very closely with the Environmental Research and Wildlife Development Agency, ERWDA, both in terms of work in the field and in the planning of the ERWDA-managed Abu Dhabi Environmental Database. One of the areas where this collaboration is most important is in the Marawah Marine Protected Area, MPA, which not only covers several thousand sq. kilometres of shallow waters, but also a large area of coastline and several islands, including Abu al-Abyadh, Junana, Marawah, Liffiyah and Bazm al-Gharbi. 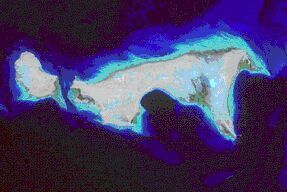 As part of planning for the management of the MPA, ERWDA and ADIAS are now preparing detailed mapping of relevant ecological and archaeological data throughout the MPA. As part of this process, Mark Beech and Ingrid Barcelo spent ten days on Marawah in late March, coinciding with the MR 11 excavations, to check all of our GPS data on sites previously identified on the island. While this work was being done, three more sites, previously unrecognised, were identified, two by Mark and Ingrid and one, a large Islamic graveyard, by Simon Aspinall and Peter Hellyer. In all, over 50 archaeological sites have been identified on Marawah, some of which include many subsites. Thus MR 9, an important collection of old hearths, has around 150 individual hearths, some of which have been shown by C14 dating to be of Bronze Age and Late pre-Islamic period date. Our mapping of Marawah is now the most detailed for any of Abu Dhabi's offshore islands - an important contribution to the Abu Dhabi EBD and to planning for MPA management. In association with ERWDA's Protected Areas team, major sites or groups of sites are now to be marked with signboards. Further mapping of the over 40 sites known on the adjacent island of Liffiyah, to the west, is now being planned for the next winter season. The Ubaid sherd in situ at Site MR1. Dr. Mark Beech and Ingrid Barcelo revisited all the archaeological sites previously surveyed between 1992-2000 on the island of Marawah during late March 2003. Whilst visiting Site MR1, an elevated area on a rocky promontory at the western end of the island, an important potsherd was identified and collected from the surface of the site. This potsherd was a piece of painted 'Ubaid ware. This type of pottery dates to the late 6th - early 5th millennium BC and originates from near the site of Tell al-'Ubaid in southern Mesopotamia, modern day southern Iraq. The sherd was broken into five fragments which could be rejoined. Clear black painted lines were painted on the exterior of the pot. ADIAS has now identified 'Ubaid pottery from four separate locations on the islands of Abu Dhabi: at Ghagha', Dalma, Al Aryam, and now at Marawah. Following the successful excavation of a 2.54m fossil elephant tusk near Ruwais in December 2002, Mark Beech and Will Higgs returned to the Takreer development site in February 2003. The object was to clear the area earmarked for the first phase of development of fossils discovered during previous surveys. The first fossil tackled was an hour-glass shaped scatter of surface fragments which had been tentatively identified as a hippopotamus skull. Preliminary clearing soon revealed that it was a relatively complete pair of jaws of Stegotetrabelodon syrticus, the late Miocene elephant species already known from elsewhere in western Abu Dhabi Emirate, (and from which species the tusk excavated in December came). The jaws were over a metre long, with sockets for two straight, forward-pointing tusks. They were jacketed with expanding foam for removal and are now in the ADIAS store at Maqta awaiting conservation with the other fossils excavated in February. - The upper part of a femur. View of elephant ribs being excavated at Site MR48 in Ruwais during March 2003. All were assigned to the same elephant species, S. syrticus, apart from the femur which appears to be from an antelope-sized animal. Other interesting finds included two fossil interior casts of large bivalves close against one of the rib fragments. This turned out to be a freshwater Unionidae, a type of bivalve only found in clean, running water. This palaeoecological information confirms our suspicions that the fossils were laid down in flowing water and explains the similarity of our fossil assemblage to that excavated at Shuwaihat in the 1990s. Those excavators also came to the conclusion that their fossils had been scattered by flowing water and had come to rest on gravel banks. We are indebted to Takreer for the extensive support offered to ADIAS during this campaign, and the repeated expressions of interest in the project, and the concern for its successful conclusion voiced by Takreer officials. Members of the ADIAS team will be taking an active part in a seminar in Al Ain at the beginning of April. Organised by the Zayed Centre for Heritage and History, part of the Emirates Heritage Club, the seminar is entitled "Current developments in Palaeontology and Archaeology in the Emirates," and is being attended by members of archaeology departments from throughout the UAE, members of foreign archaeological teams undertaking work in the country and other invited guests. Papers on two aspects of ADIAS fieldwork are due to be presented, both dealing with our recent palaeontological work. The first, on the Ruwais Late Miocene fossil site, is being presented by Dr. Mark Beech and Will Higgs (from the University of York), while the second paper, by Will, Mark and ADIAS associate Professor Drew Gardner of Zayed University, is on the Late Miocene site at Mleisa, where several hundred fossil footprints of elephants have been identified. ADIAS will have a strong team at the Seminar, with participants, besides the presenters of the papers, including Peter Hellyer, Dr. Geoffrey King, Simon Aspinall, John Martin, Ingrid Barcelo, Karen Cooper and our Fujairah-based associate Dr. Michele Ziolkowski. Papers from the seminar will be published in due course. Three new papers have been published recently on ADIAS work. The latest issue of the journal Tribulus (Vol.12.2), contains a lengthy paper by Peter Hellyer on "Newly-discovered Coastal and Island Archaeological Sites in North East Abu Dhabi." The paper summarises results of survey work in the Shanayel and Rumaitha areas, south west of Abu Dhabi, and on the Dabb'iya peninsula and its adjacent islands to the west, including Qusabi and Rufayq. From a little further west, a short report on the ADIAS survey on the island of Abu al-Abyadh is published in the March 2003 issue of the journal Antiquity(Vol. 77, no. 295). Written by Daniel Hull, our former Resident Archaeologist, and Stephen Rowland, and entitled "A Survey of the Island of Abu 'l Abyadh, UAE," the paper provides a brief overview of the island's sites, which range from the Late Stone Age to the Late Islamic in date. Finally, our Senior Resident Archaeologist, Dr. Mark Beech, has contributed a paper to the latest issue of the Journal of Oman Studies (No 12: 25-40). Entitled "Fishing in the 'Ubaid: a Review of Fish-bone Assemblages from Early Prehistoric Coastal Settlements in the Arabian Gulf," the paper reviews results from the ADIAS site on Dalma as well as from other Late Stone Age sites in the UAE and the Gulf, including Umm al-Qaiwain, Khor, in Qatar, al-Markh, in Bahrain, al-Dosariyah, in Saudi Arabia, and H3 in Kuwait. Copies can be obtained from the ADIAS office. 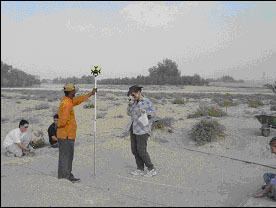 Karen Cooper (right) volunteering on the archaeological excavation at the Al Ghazal Golf Club near Abu Dhabi airport (December 2002). More staff changes to report this month. Ingrid Barcelo, who has been working with ADIAS part-time since October 2002 as an administrative assistant (and helping out with fieldwork at Abu Dhabi International Airport and Ruwais), has now taken up a new post with the Terrestrial Environment Research Centre, TERC, of the Environmental Research and Wildlife Development Agency, ERWDA. TERC's gain, however, is definitely not completely our loss, for Ingrid will continue to keep an eye out for sites in the desert when undertaking fieldwork with her TERC colleagues. Indeed she and Chris Drew, also of TERC, have already identified an important Late Stone Age site in the desert, not far from Umm az-Zamul. ADIAS plans a detailed study of the site, around the edge of an old lake-bed, next winter. Ingrid is replaced by Karen Cooper, whose first connection with ADIAS was as a dedicated (and very useful) volunteer during the Abu Dhabi Airport work last December. Karen will be working in the ADIAS office to help our Senior Resident Archaeologist, Mark Beech, to catch up on all the paperwork that has accumulated during the last few hectic months of fieldwork. She will also take on the task of preliminary design and planning for two small displays, one at the Airport's Al Ghazal Golf Club that will focus on finds from the Airport site, and the other, of fossils from Ruwais, which will be housed in the ERWDA headquarters. Following completion of our last season of fieldwork at the sulphur mines at Jebel Dhanna early in 2002, directed by our former Resident Archaeologist, Daniel Hull, a final report was submitted last year to the Abu Dhabi Company for Onshore Oil Operations, ADCO, who kindly supported our fieldwork. A scientific publication on the results of our study is now being prepared, which is being edited by ADIAS Academic Director Dr. Geoffrey King, of London University's School of Oriental and African Studies, SOAS. As regular readers of the Occasional Newsletter will know, the sulphur mine complex, which includes around 150 individual mine shafts and many underground tunnels excavated into the jebel, is the only one of its type in the Emirates, although there are historical references to similar mining complexes on the Iranian side of the Gulf. Although we have been unable to find any reference to the Jebel Dhanna mines in the historical literature, a combination of radiocarbon (C14) dating and pottery analysis suggests that the main period of use of the mines was probably in the late 17th and 18th Centuries, although some sulphur extraction continued well into the 20th Century.